Spraying boat outside safety ? After numerous failed attempts of trying to get someone to spray my boat, I have decided to tackle the project myself. I was thinking of alternatives to a respirator since i have a thick beard and know the 2k paint is no joke. I have a scuba regulator with a 75 foot hose that i was thinking could be used as a supplied air system (am i crazy) ? I cant justify buying a system for just one project. If anyone is done this project outside, what did you do right or wrong? Thank you ! I was thinking of making some kind of temporary enclosed area. There are some trees overhead and I’m sure the passing squirrel would Drop some stuff right on the fresh paint. spray what? gel coat? bottom paint? paint? on what? bottom? hull? topsides? A catalized urethane should set up pretty quick. Use plastic to tent the boat and wait for the right weather. Should be ok. Buy the correct respirator, stuff can kill you. As above start with some sort of enclosure and set a big shop fan to blow in at one end. Start the fan before your last solvent wipe and wet down the surrounding area with the water hose before you start spraying. Early(ish) morning seems to be best for minimal bug activity. I'm not uber familiar with 2K urethanes but I had it in my brain an air purifying (vs supplied) respirator was all you needed. If you go with the regulator in your mouth, what you absorb through the eyes can be just as deadly. I don't know what you can wear over your eyes that will seal them up but not get fogged without clean fresh air. As a firefighter paramedic, I was told of a story where a thug went into a house to rob it that was tented to kill termites, wearing a scuba tank and breathing through the regulator but with no skin or eye protection. He was transported to the E.R., the Doc's told him he had 24 hours to live, he lasted about 18. I know paint is not as deadly as Vikane but your eyes are a super absorbent portal to your body. Good luck and please protect yourself. A respirator with the correct filters will work outside if you can get it to seal on your beard. Get a Tyvek suit. You don’t want the overspray on your arms. That stuff attracts bugs like crazy. Takes about 30 minutes to be tack free. Either shave or get a hood system and cover any bare skin. It feels like getting hit by a truck and then an elephant standing on your chest for weeks after. my idea was to use a dive mask covering the nose as well and use the regulator with a full hooded tyvek suit and good gloves. Not sure if the regulator will work 100% sealed but if it does underwater i wouldnt see why it wont in this situation. Did you learn the hard way with this stuff ? There are supplied air painting hoods, but then you need a list of items to actually use it. Most standards will require a grade d breathing air certified compressor, along with a regulator, water/oil separator, and a co monitor/ alarm. An alternative is a spray sock, then then a full face respirator. Its not ideal and wont be 100% but should work well enough if combined with a tyvek suit with a hood. iinteresting about the sock and full mask. I am looking at easiest possible without spending a ton of money. If i have to do that to get the equipment im better off paying someone to spray it. I have a clean scuba tank with 75ft of hose and a good clean regulator. If i fully enclose a face shield and use that it just seems like it would work since the air is coming from a clean source plus 1hr plus breathing time more than enough to spray hullsides. Last edited by hookedonshenanigans; 01-17-2019 at 10:26 PM. 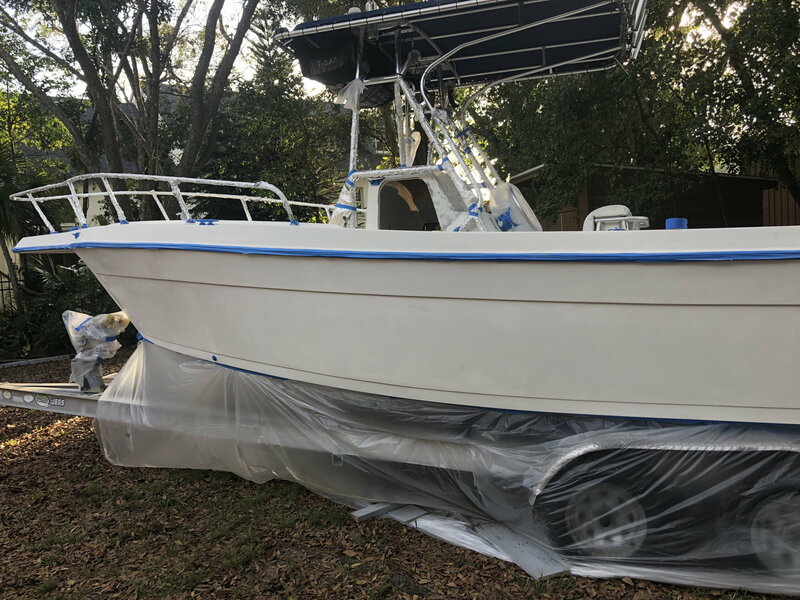 I have used the spray sock, full face, and tyvek with hood when doing glass work and painting in the bilge area and other low, enclosed areas and it works for me. I typically don't shave often and have a scruffy beard, but nothing grizzly adams like or anything. Polyurethane gives me a massive headache even in pretty open, ventilated areas, so I always use respirators. After numerous failed attempts of trying to get someone to spray my boat, I have decided to tackle the project myself. I am curious as to the reasons given for a pro to not want to shoot your boat? A tent should be built for spraying. The atomized mist is combustible.....spark proof tools and explosion proof fans need to be used if they are in contact with the enclosed area. The body skin needs to be covered....especially the eyes....and a respirator used of a type recommended on the MDS for the product used (probably a2/p2 but not sure). You also need to see the product recommendation for humidity recommendations........spraying in the wrong conditions may affect gloss. The Kook Abides and NC Mike like this. If you do a tent. before you paint spray the ground with water so you dont kick up any dust. Here's a thread where the owner is spraying a big magnum in a tent, close to a mango tree. results are impressive. as stated, I'll be concerned with proper against those chemicals.